Fleur de Blanzac, Guaranteed pure Charente grapes. Tous les Cognacs Grandes Champagnes Dubois Frères & Cagnoin, sont garantis authentiques et proviennent de la distillation exclusive de vins récoltés dans la région de Cognac, délimitée par le décret de 1er Mai 1909. Ils sont accompagnés de l'Acquit Jaune d'Or, garantie officielle d'authenticité du Gouvernement Français. 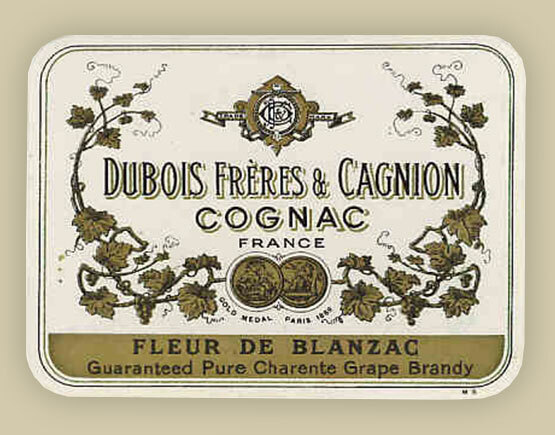 Dubois Frères & Cagnion is a cognac house founded in 1860 in Blanzac, Charente, by Adolphe Cagnion and the Dubois family. All the grand champagne cognacs of Dubois Brothers & Cagnoin, are guaranteed authentic and come from the exclusive distillation of grapes harvested in the cognac region, distinguished by the "Décret du 1er Mai 1909" giving the district the exclusive right to use the name Cognac and preserved by ‘de L'Acquit Jaune d'Or', an official guarantee of authenticity by the France government. 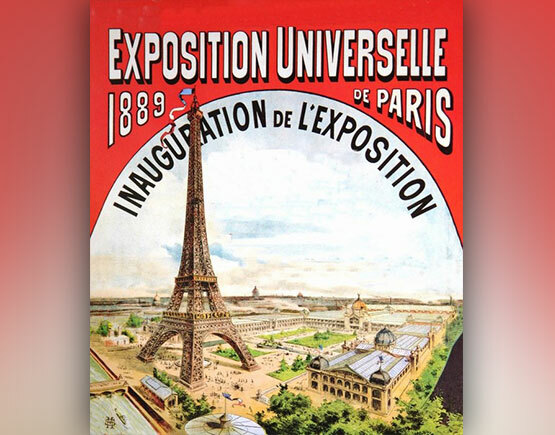 The brand is a Gold medal winner at the Paris World Fair in 1889. Other well-known cognac distillers in Blanzac are Jean Balluteaud, Auguste Magnier and Angel Guillot. 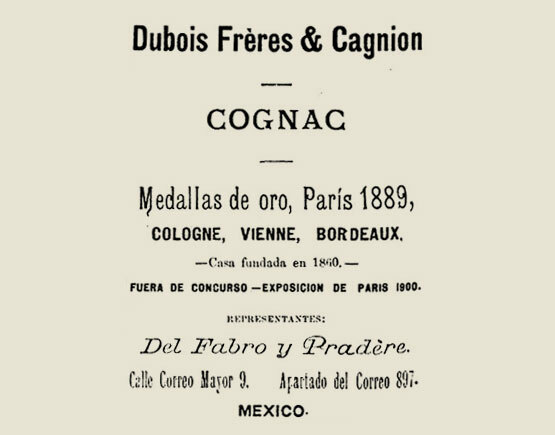 Dubois fréres & Cagnion had substantial growth in the 70's of the 19th century, with participation in the Universal Exhibition of Vienna in 1873, and constructions in the district Saint-Andre de la Ville, creating new cellars, shops, a distillery and a "Chateau." 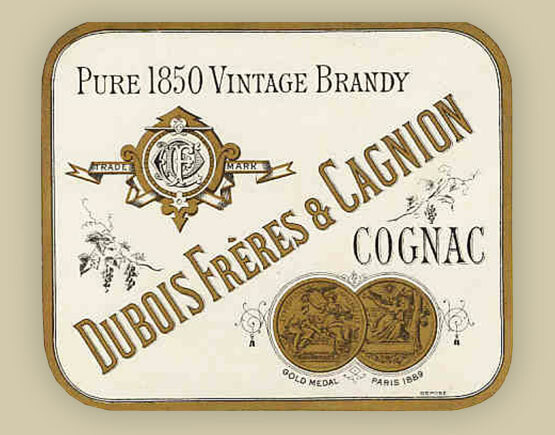 Dubois Frères & Cagnion is a cognac house founded in 1860 in Blanzac, Charente, by Adolphe Cagnion and the Dubois family. All the grand champagne cognacs of Dubois Brothers & Cagnoin, are guaranteed authentic and come from the exclusive distillation of grapes harvested in the cognac region, distinguished by the "Décret du 1er Mai 1909" giving the district the exclusive right to use the name Cognac and preserved by ‘de L'Acquit Jaune d'Or', an official guarantee of authenticity by the France government. The brand is a Gold medal winner at the Paris World Fair in 1889. Other well-known cognac distillers in Blanzac are Jean Balluteaud, Auguste Magnier, and Angel Guillot. 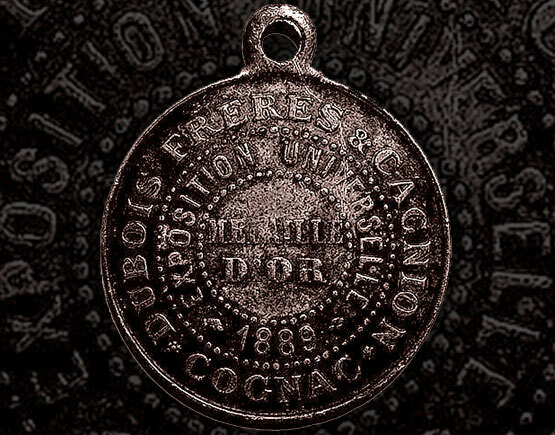 Dubois fréres & Cagnion had substantial growth in the 70's of the 19th century, with participation in the Universal Exhibition of Vienna in 1873, and constructions in the district Saint-Andre de la Ville, creating new cellars, shops, a distillery and a "Chateau." Adolphe Cagnion, born in Blanzac and deceased in Paris, is a member of the General Council and the Archaeological Society of the Charente, and chairman of the Viticulture Committee and the American Vine Association of the canton of Blanzac. The Dubois family is represented by Calixte Dubois, a banker, born and deceased in Blanzac, mayor of the municipality of Blanzac in 1871. His three sons Albert, Marcel, and Gabriel are well-known local traders. After the death of Cagnion, the brand Dubois Frères & Cagnion and the distillery returned to Albert Dubois in 1910, and to Adhémar Balluteaud in 1928.